IH Malta is a part of big chain of schools offering high quality courses all year round. International House Malta has been in operation since 2001. International House Malta offers students individual attention and tailor-made courses all year round in an environment that matches their individual needs. Students will be provided with a very high standard of teaching with IH qualified teachers in well-lit fully air-conditioned classrooms. • 24/7 customer care emergency number and a travel insurance is available. Number of lessons per week: (45 minutes each): 20. 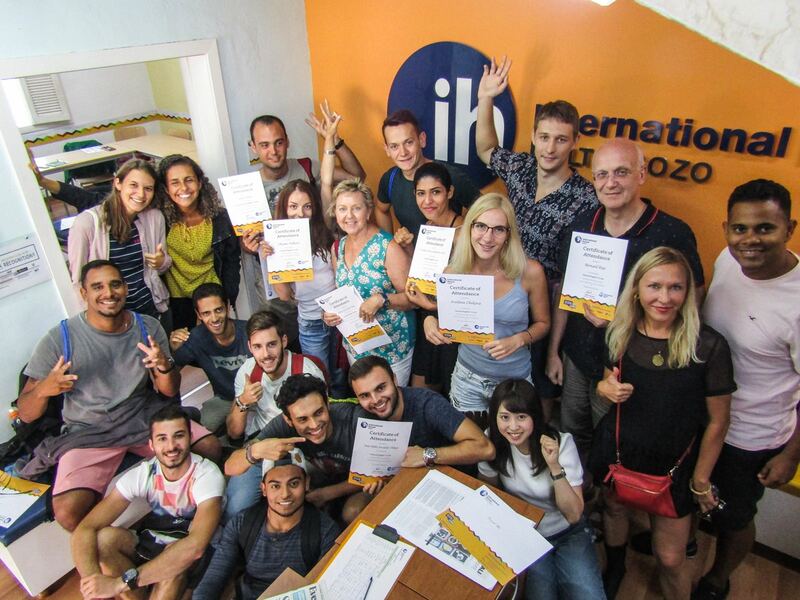 Experienced and qualified teachers use a communicative approach to develop skills in listening and speaking in English for social and travel purposes. Students work on topical material and a certificate of attendance is awarded at the end of the course. Course offered all year round. Number of lessons (45 minutes each): 30. Intensive Course offers additional group lessons which are planned in coordination with the morning group lessons. These would focus on improving oral fluency or other weaknesses. Number of lessons (45 minutes each): 20 in group & 10 One to One. The course consists of 20 lessons in a group in the mornings with 10 individual tuition lessons in the afternoons. Group lessons are designed to be useful to all participants whereas during the afternoon lessons, students have the opportunity to improve on weaknesses covered during the group lessons or identify other areas on which more focus is needed. Belview features a number of single, double, triple and quadruple bedrooms. The accommodation is Self catering, situated 5 minutes walking distance from INTERNATIONAL HOUSE Malta St. Julian’s school, 5 minutes away from the city centre and 10 minutes away from the public sandy/rocky beach. Belview is a newly refurbished villa. It is fully licensed as «Comfort» Category by the Ministry of Tourism of Malta.It is ideal for holiday makers and students who want to benefit from comfortable, very clean and affordable accommodation in Malta. There is a large, very well equipped common kitchen and dinging room. There is also a living and TV lounge and a large roof terrace. All rooms have large balconies and are very well sun lit and airy.Service includes weekly cleaning and change of linen. There are also washing clothes facilities. Belview features a number of single bedrooms. The accommodation is Self catering, situated 5 minutes walking distance from INTERNATIONAL HOUSE Malta St. Julian’s school, 5 minutes away from the city centre and 10 minutes away from the public sandy/rocky beach. International House's Malta host families are all situated within a 20 minutes’ walking distance to the school. They are close to all amenities, including St. George’s sandy beach, restaurants, shops and the main bus terminus. Students will be provided with their own room that has all the needed furniture for living and studying; bathroom is shared with other people in the house. Host family accommodation may be booked on Half Board Basis. Special dietary requirements, such as celiacs, lactose intolerance, vegetarian menus, etc., are catered for upon request. All the host families are fluent in English, therefore making it ideal for students who want to study and converse in English. The majority of IH's Malta host families have pets. We will do our utmost to accommodate students who have allergies accordingly. Pictures are just examples of how Homestay accommodation may look like. It doesn't mean that you will get any of those rooms. LinguaTrip team and IH school will find a perfect house for you to stay, also depending on your requirements. International House's Malta host families are all situated within a 20 minutes’ walking distance to the school. They are close to all amenities, including St. George’s sandy beach, restaurants, shops and the main bus terminus. Students have the choice of booking shared bedrooms, even when travelling alone. Host family accommodation may be booked on Half Board Basis. Special dietary requirements, such as celiacs, lactose intolerance, vegetarian menues, etc., are catered for upon request. The majority of IH's Malta host families have pets. Everything possibe will be done to accommodate students who have allergies accordingly. Pictures are just examples of how Homestay accommodation may look like. It doesn't mean that you will get any of those rooms. LinguaTrip team and IH school will find a perfect house for you to stay, also dependingon your requirements.